An open-top motorhome for making the most of fine weather trips may seem like an impossible concept, but that’s just what US hot-rod builder Randy Grubb has created — well, sort of. The DecoLiner is based on a 1973 GMC motorhome — a classic design that a six-wheel chassis and aluminium body — and is the result of 5,000 hours of work and over $100,000 of parts. The resulting teardrop-shaped motorhome is very striking, but perhaps its most interesting feature is the ‘flying bridge’ built onto the vehicle’s roof that can be used for driving. The top deck is reached from a staircase that runs from the back of the DecoLiner and uses a mechanical linkage for steering — this can be quickly removed to restore steering control to the cab. 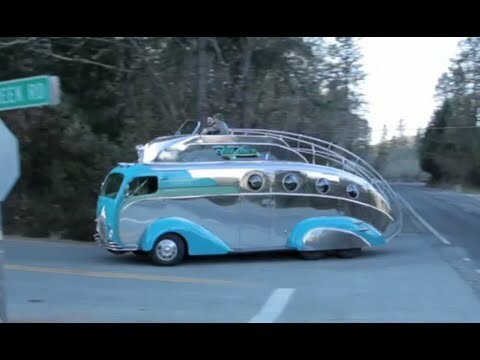 There’s a lengthy interview with Randy Grubb in this YouTube video, along with a test drive of the DecoLiner — which, incidentally, is for sale at $500,000. Skip to the 4m 38s mark for the interesting stuff.